Summer sizzle is one of the most marvelous things for the travelers. Because it indicates there will be pleasant vacation. If you do agree with this statement, you must prepare for your time-off soon. Since the weather is getting warmer, it would be nice to dip yourself in the swimming pool. Of course, you are seriously in need of great floaties. Without further ado, here are yummy-looking pool floats to add some fun. Swimming pool is like summer haven. You can make your day way hilarious with pizza-shaped pool toy. It is specifically designed to give you maximum comfort. Plus, it completely resembles delicious pizza slice. When you crave for supreme or pepperoni pizza, just float around on it. Who says you can’t enjoy eating taco in the pool? Indeed, it is wrong. This tasty taco pool accessory surely will be your best pool pal. Moreover, it comes in the gigantic size and seats up to 2 adults. Its picturesque appearance is too difficult to pass up. Normally, pool and food don’t blend together. But donut-themed inflatable pool item will keep you afloat. We guarantee it won’t make you feel upset because it is so realistic. Not only is it ridiculously big, but also looks really delectable. It shall be an addition to any summer sanctuary. We think this fancy floating mat is gonna be loved by lots of people including kids. Once they have colorful floatie, they likely set up a birthday party. It is undoubtedly true that it is the most popular one. Wanna give a wonderful gift to your adorable kid? 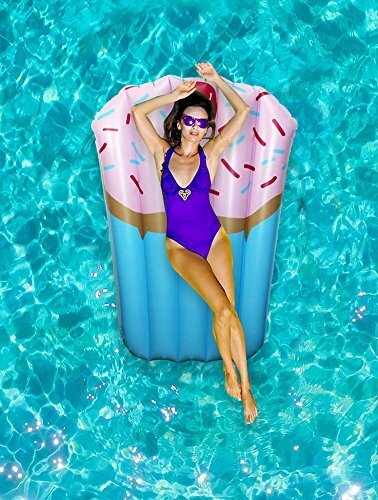 Toothsame cupcake pool float is such genius idea. When you are in doubt about choosing the right destination. Bali definitely should be put on your bucket list due to its all year-round summer. If you travel to Bali, you can soak up the sun on cozy and appetizing pool toys. Grab enchanting floaties at Ruby Floaties fast. There is a broad option of delish floaties with extremely cheap rental prices for you. In addition, Ruby Floaties provides free delivery and pick-up. It couldn’t be more awesome, right? Check the collection out on Instagram @rubyfloaties. To order floaties like you want, please contact us at number 08123966865 through Whatsapp, SMS or telephone. Wish you have a fantastic vacation!